"Can you even read?" you might ask me as you notice the club thread. "There's already a Michigan club. This double thread deeply offends me." But, geographically speaking, Michigan's upper peninsula is practically another state, and our regular Michigan club focuses mostly on the lower peninsula. Disturbingly, it's also a partial-state without much pinball, and perhaps the few yooper Pinsiders among us can help change that. I'm working on my part - if you happen to pass through Escanaba and feel like playing my recently-purchased Rollergames, stop into 41 Lumber. It'll get a proper rework in the future, but given the number of compliments I've gotten on its condition, people here don't seem to mind that it's not a HEP. This won't be an elite club. If you live elsewhere but happen to pass through the U.P. now and then, feel free to come join us. We don't bite. Much. Location update! Wasn't keeping up on this thread since it had no activity, but hey - here's some activity! I had to pull RG due to a connected chain of problems stemming from a locked-on magnet driver. This problem is half fixed now - I believe there's a primary driver transistor that still needs replacing - but I decided it would be best to put a known reliable game from the collection at the store. And what better game to bring in for the Halloween season than Addams Family? It's had a couple of very minor issues, but nothing game breaking. The weekend before loading up the game, I did a quick teardown in which I replaced all the rubber with Titan Pinball's offerings, gave the playfield surface a once-over with Novus 2, and converted it to LEDs. 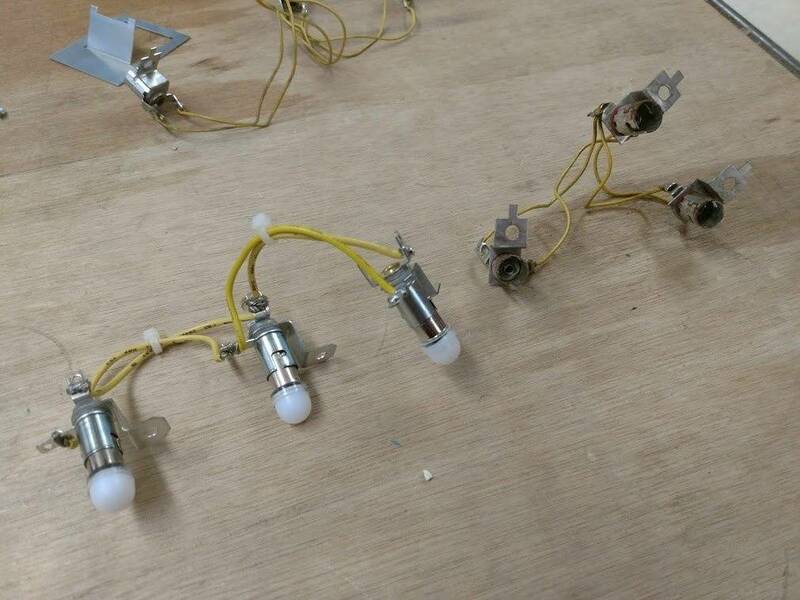 Yeah, so about that LED conversion. I picked up "complete" LED kit for TAF at a show earlier this year, and finally got around to tearing open the bag for this job. All the GI bulbs were purple, and the bulbs designated for Cousin It's light were green. I am NOT letting my games get featured in the No Rainbow Puke Club thread. There was at least a handful of cool whites in the bag, so I installed them into a few GI sockets to see how it looked. Normally I'm into warm white, but I didn't really mind the cool tone on this particular game, so I put in an order for more cool whites to cover the rest of the GI. The day after I finished the job, I brought the game in. There wasn't a lot of time for testing, so the old worn-out lamp sockets made the slingshots and inlanes flickery and/or dark. Fortunately, fixing that issue was just a matter of constructing a new set of GI mini-harnesses and bringing them into work the next day. Old vs new shown. I think the new sockets will be a tad bit more reliable. Hey my family lives in Marquette i was born and raised there just moved to Colorado but I’m in! I head home a few times a year and always lookin g for games. So when you play, is that the heater above your head and does it blow directly on you? I hunt with the wife's family outside Iron Mountain and my daughter goes to NMU, so I'm up that way quite a bit. Grew up in Da UP, and was just up last week for deer hunting and turkey. Nice to visit, but yeah, not much pinball. Glad you have a game out for folks to play! Awesome, we're not alone after all! 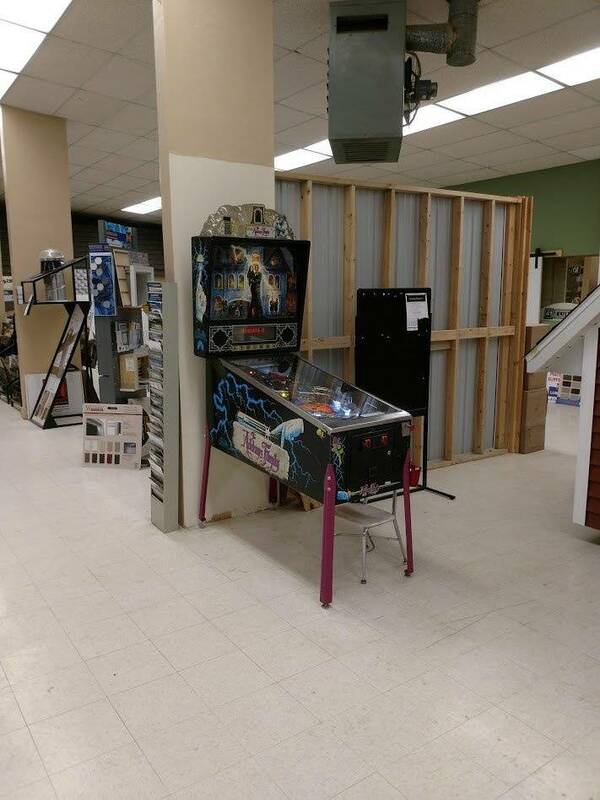 I have a friend with growing pinball repair skills who I believe will be joining us in this thread soon. We've already had some discussion on how to get more pinball up in da yooper country. I have already imported three, one via pickup and two via shipping. Gosh, it would be nice if that heater did blow on players. Maybe it would attract more people to play in the cold season! It actually blows to the left in the photo. Camp is off of Peavy Falls road towards the dam. Cool. 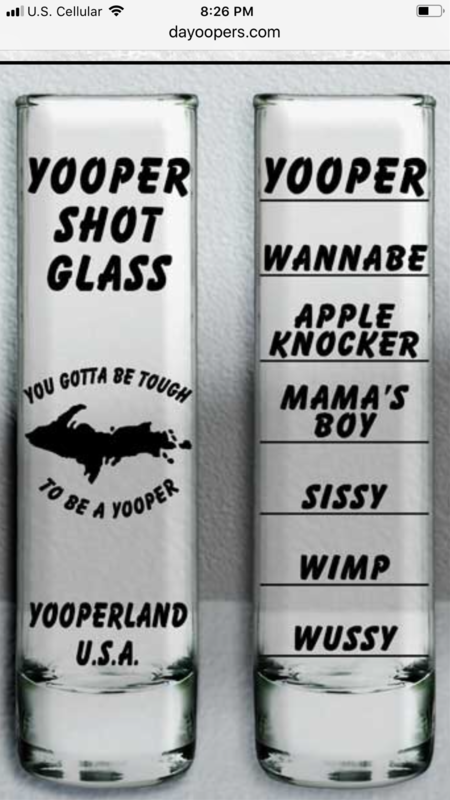 Your wife must be a yooper. Well i will start things off here..i have a nice players Black Knight and/or a nice players Arena I would be willing to trade for a system 11 (space station, dr dude, other) or DMD plus cash as needed. If anyone has interest, let me know what you have, and I will post listings with more details/pics in the marketplace. People actually live in the U.P.? I thought it was just for hunters and kids who couldn't get into MIT. Hey dare, howess it goin. Love da u.p.! I'm not official, but I'm a hell of a lot closer to the UP then most of the Madison/Milwaukee crowd. Can I get a waiver? I live in Pasadena, so...I'm closer to you than about 90% of the people on the planet! I'm closer to you than about 90% of the people on the planet! Let's keep it that way. The UP would be far less enjoyable if that were not the case. Interesting tidbit. The u.p. Was originally Wisconsin (territory). But since Michigan reaches statehood first it was given to Michigan. Read up on the "Toledo War" for more on why the UP is in Michigan and not Wisconsin. I sold our place at Big Powderhorn Ski Area, 2 years ago after owning for 25 years. Great times, still have storage unit in Wakefield, housing 2 sleds, 6 pairs of skis and snowshoes . Don't forget the pair of cross-country skis used at ABR. Still have ski pass to Blackjack and Indiandhead. I love it up there. My picture is with my grandson snowshoeing by our chalet. I put an ad in the old Porcupine Press years back looking for EM pinballs/collectors. No replies. Most of my pins have been 10+ hour drives to buy and get them up. A bunch have been hauled behind a snowmobile on the last leg. I just put on my Art's Tavern sweatshirt after a long day of work. Spiritually, I'm now only about four hours from the UP. My proposal is we hoard as much pinball as we can up here, but share with the general public when possible/willing by putting stuff on route. I've imported three games into yooper country and TAF is still running strong, so I'm trying to follow that rule. Condition update: Both the microswitches on the TAF ramp assembly went dead, one after the other. Both were fixed overnight with spares. Otherwise not a single problem in two months. 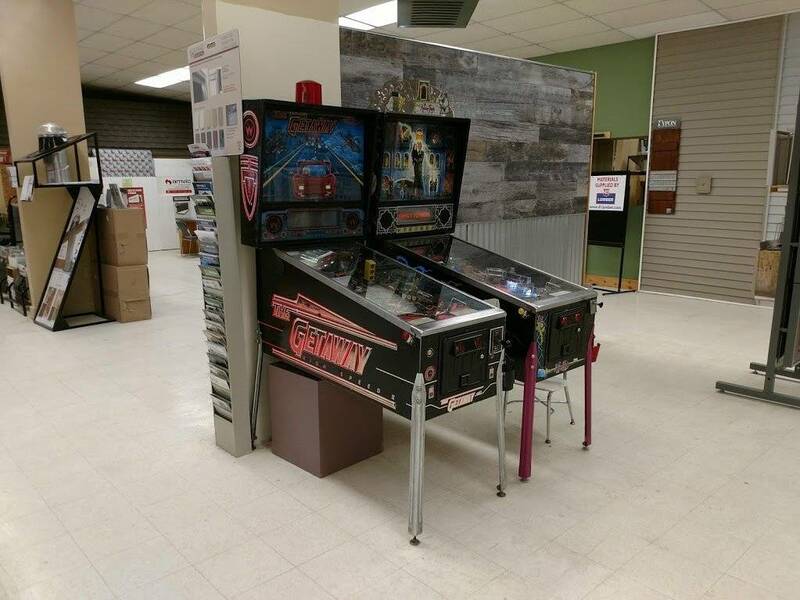 for those into EMs, Old School Arcade in Gwinn has 7 or 8 EM pins. I’m in St.Ignace, my dad and I own Enterprisevendinginc we service a 60mile radius of full coin op including mackinac island I am also a collector. I lost locations to play our pins we have on route all the time in the pin map. Pinhead86, back in about 2002 my family visited Mackinac Island and stayed at a Budget Host motel. Literally the highlight of the trip for me was playing Big Guns in the motel game room. Was that yours? I recall it had a set of classic Bally/Stern flipper bats installed on it. Doing my part to keep pinball in the UP. I'm considering putting this one on route after it's gotten a thorough restoration. I have lurked much, crash-coursed and studied my way through the ropes of buying, maintaining and enjoying, (most important!) pinball as an adult for the past 2+ years. I have an interesting story as to how I was brought back to pinball - I prefer to tell it over a beer...pinside. My machines are fluxing in and out of operation as I dial them in for route, with much help and support from our Thread-Head, KC. I can't drop much weight on purchasing, aquiring titles...but I'm working on getting a few pins from family on route in the UP. 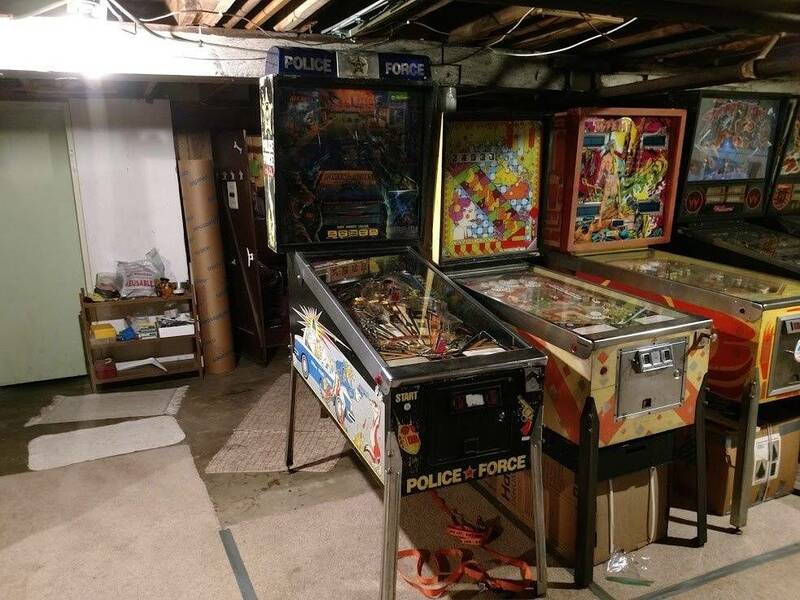 My vision is for pinball to be beyond some spoiled "lake house man-cave" showpiece UP here; these works of playable art ARE NOT coffins for our pastime memories - they should and can be catalysts for the next generation's critical thinking and creative commons. I'm willing to overcome my anxieties surrounding social media in order to work towards propagating pinball across the UP over the next decade. I run live sound and jam on every instrument as well; open mics with Pop-UP Pinball, (TM...j/k,) is in the works this summer. Also, would be interested in seeing who else would carpool on trips to Tiltletown Pinball in GB, (45+ machines on Freeplay between monthly tournament and leauge play,) and just general community, such as, "help me move these flippin' machines," to "let's fix this thing and get it in public!" Much props and thanks to Kelly for getting this all rockin'. Very available to meet, troubleshoot and chat. Stop in above Mo's in Esky and we'll tour the machines we've managed to set up, so far. I used to work in Marquette a lot until I switched jobs last Feb. If I start heading back up, I'll be sure to check this thread first. Love it up there! Sorry, didn't see this post until today. The small arcade on the second floor off a ferry dock entrance was gone in 2018. My wife and I go to the island every May, and I was disappointed that the only 2 pins I could now find were at the Mustang and the Grand. Any chance of that or another coin-op arcade like it returning to main street? nudgerfoder Welcome aboard! Glad to see you in the club. Probably not on main street but we do have an arcade at Mission Point Resort. We will have pinball there just not sure which one/ones yet. 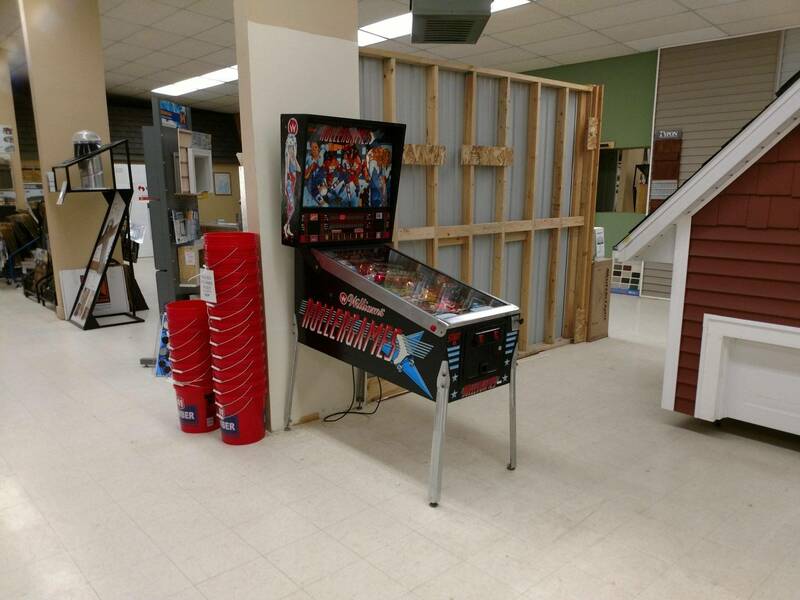 Depending on where you board to go to the island we do have pinball throughout Saint Ignace to play if you check the map here on pinside. Thanks for the info. We always take the ferry from Mackinaw City, so I probably won't go to look for pins in St. Ignace. We're staying at Bay View this year, not too far from Mission Point. I didn't know they had an arcade there, I'll have to check it out. Those of you within reasonable distance of Escanaba now have a new title to play! It'll need a bit of tweaking and fixing but it's definitely a popular one already.